Improved overall design from Lexmark. 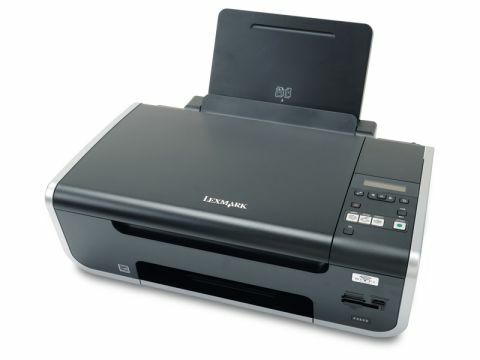 The Lexmark X4650 is a multifunction device with scanning, printing and copying that lets you send files to and from the machine wirelessly or over USB. You will need a wireless router compatible with IEEE 802.11g to exploit these features. The unit has camera card slots for standalone printing, too, though with no LCD panel it's tough to print on-the-fly without attaching your camera and using it to browse the images – a shame it's missing. Setting up the printer on one of our wireless networks was very easy. A colour-coded connection indicator on the printer helps, and Lexmark has done a good job of streamlining the process on its installation guide. Printing wirelessly was fast enough to be used as our default method. There was not much latency to worry about. A single page of text took 12 seconds to appear. The printer does give you the option of scanning directly to applications on your Mac, but failed to send a scan direct to iPhoto as directed on the onboard LED display. was feathering on 8-point Baskerville, and alignment trouble. For printing something to read you would be fine, but for presenting documents and letters you can get better for the money, such as the Canon MP600R. Scanning was a high point. Scans were clear and arrived back on our Mac very quickly, again with no annoying latency issues. Colours were true and resolution not bad for an all-in-one. Overall, it was harder to bash this Lexmark release than previous home printers because most things here work well. However, that said, printers are so good these days that it wouldn't be prudent to recommend this printer over a Canon or Epson model at this price point.